Another comedian hosting a primetime quiz show for the BBC in 1984 was Bob Monkhouse. From the 1980s onwards, Monkhouse would routinely flit from commercial television to the BBC and back again. He started 1984 as the figurehead of ITV game shows, enjoying an almost unbroken run of presenting stretching right back to 1967 when he took over from Jackie Rae as host of The Golden Shot.The series, described by critics as a “dead duck” prior to Monkhouse’s debut, was revitalised by the arrival of a slick, professional presenter, able to cope with the complexities of live television. Throughout its eight-year run, Monkhouse distinguished himself as the only one of The Golden Shot’s five presenters actually able to make the show run smoothly. Charlie Williams, in particular (who took over after Monkhouse’s first tenure), was overwhelmed by the series’ complexity and proved unable to contend with the simplest of things – even on occasion the names of contestants. Conversely Monkhouse could include in his act jokes at the expense of contestant’s occupations, and even on one occasion the delivery of an ITN newsflash. On top of all of this came the weekly bomb threats (apparently de rigourfor live television programmes in the 1970s). All were grist to Monkhouse’s mill. The Golden Shot was followed by four years of Celebrity Squares (1975-79), a series that failed to capture the public’s imagination to the same degree, but allowed Monkhouse to further hone his mastery. Celebrity Squares was similar to Blankety Blank (Terry Wogan appeared on the first episode of the former). Both involved a panel of celebrities aligned neither to one contestant the other, required to provide the “right” answer to questions posed by the host. With its top prize of a brand new car though, Celebrity Squares took itself altogether more seriously than the BBC show. The final game show that Monkhouse would present for ITV in the 1970s was Family Fortunes. Based on the American series Family Feud,it was tailor-made for Monkhouse’s slick presentational style. However – as the comedian recalls in his autobiography Crying With Laughter – not everyone thought so at the time. “Michael Grade had bought another Californian game, Card Sharks, intended as a LWT vehicle for Bruce Forsyth,” remembers Monkhouse. “After studying his acquisition closer, Grade called (Francis) Essex (ATV’s head of light entertainment): ‘Have you still got Monkhouse under contract? My people have just picked up a show in the States that’d be perfect for Bob … Bruce Forsyth wants to do it but, to be frank, it’s not his style at all … Do you want to unload that Family Feud thing on me in exchange? I believe it’s very physical, much more Bruce’s kind of thing. We’ll do a straight swap, what do you say?’” Sensing that Card Sharks (later to be renamed Play Your Cards Right) to be the weaker format, and presumably mindful of the IBA’s insistence that the game had to be changed to ensure that an element of skill was required, Essex declined Grade’s approach, electing to stick rather than twist. Both series would do well with Play Your Cards Right attracting a high of 15.8 million viewers during its first run, while Family Fortunes just pipped it with 15.9 million viewers tuning in to the 20 January 1980 edition. Monkhouse stuck with Family Fortunes for four series, bowing out in 1983, in part thanks to a change in personnel at ATV. Francis Essex, who had done much for Monkhouse’s career had been replaced by Jon Scoffield, a designer turned producer, who while attaining an excellent track record of successful musical showcases, had a reputation for being difficult to work with if he took against you. For whatever reason he failed to be in thrall to Monkhouse, and consequently the working relationship between the two led the comedian to look for new outlets for his presentational mastery. “They wanted me to bring the show business element of my ITV shows together with a richness of wit that lives up to the BBC’s light entertainment output,” said Monkhouse in 1984, in an effort to explain his “defection” to the BBC. “ …the support they’ve given us has left my mouth open. In America, of course, they spend millions developing a show like this, but in all the years I’ve been doing them I can’t recall a British series getting the encouragement Bob’s Full House has had”. 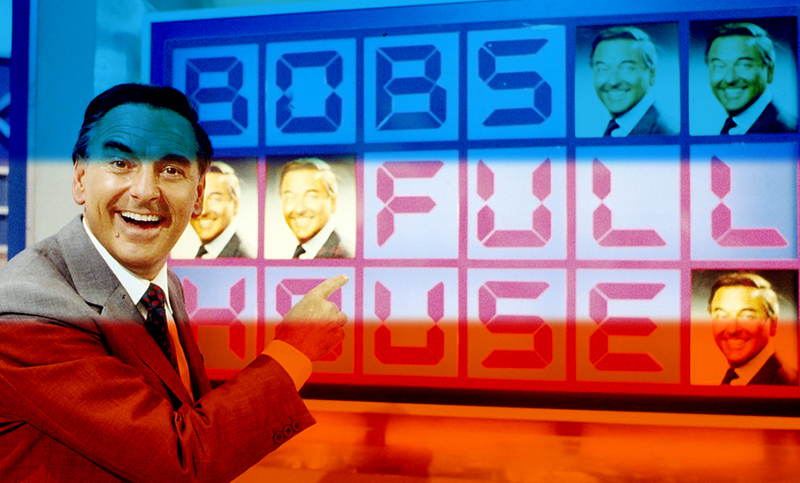 Based on an idea devised by Blankety Blank warm-up men, Bob’s Full House (or Top of The Shopas it was to be originally titled) looked to be an interesting proposition, yet one that provoked deep concern within some in the corporation who felt that a game show based around bingo was too downmarket for the BBC. “The BBC were nervous in advance,” confirms Monkhouse, “I think they anticipated getting murdered in the press. They fully expected to be hit with: ‘Oh dear – Auntie’s playing bingo!’” Consequently the format went through one year of development and 37 revisions before it was deemed acceptable. “We knew it had to be upbeat, healthy and in no way sleazy,” Monkhouse explains. “There also had to be a high level of intelligence – contestants had to be seen to deserve to win prizes”. “We tried every possible variation – using six contestants, then three, settling on four; trying bingo cards with 60 numbers, then 30, finally only 15; making it from a single, continuous game into one that built in tempo through six rounds, then five, at last a mere three with a sudden death challenge for the two front-runners, a notion I disliked.” For a time there was even plans to broadcast the show live with viewers able to play along in a national bingo game courtesy of Radio Times. Further changes were requested after Bill Cotton (then managing director of television services) dismissed the pilot show. Marcus Plantin (who also served as a producer on Blankety Blank) devised a new end game for the second pilot – “the golden bingo card”. “The seed of this idea flowered at once,” recalls Monkhouse: “I’d stand by the winning player as we looked up at a display of numbers. For each correct answer to my simplest questions, the player could pick a number which would then light up as its own cash equivalent or change to a letter. Revealing seven letters amongst the 15 on display would spell out a ‘dream holiday destination’ like a Madeira, Florida or Bermuda”. Bob’s Full House (which some contest to be the most perfect British game show of all time) allowed Monkhouse to show off what a virtuoso presenter he in fact was (although the legend that his cue cards often read simply “joke,” prompting the entertainer to produce an appropriate humorous comment on the hoof, was apparently untrue). With talent of the calibre of Monkhouse and Dawson, the BBC had game shows sewn up. Bob had obviously done very well at ITV, but his BBC years saw him become more versatile, hosting a chat show where conedians and comedy actors took centre stage, being allowed to develop his razor sharp sense of humour on game shows, and finally becoming a well loved host of the Lottery draw. I think had he stayed at ITV, his later career wouldn’t have been as highly regarded and he would have been shunted between game shows.